Figure 1 illustrates the massive increase in the supply of graduates since the expansion in the HE sector arising from the influential Robbins report back in 1963. Back then, participation among young people was only around 10%. Now it has reached almost 40% (of those aged 20 or below). Notes: The Age Participation Index (API) is the number of domiciled young people (aged less than 21) who are initial entrants to full time and sandwich undergraduate courses as a percentage of the 18 to 19 year old GB population. 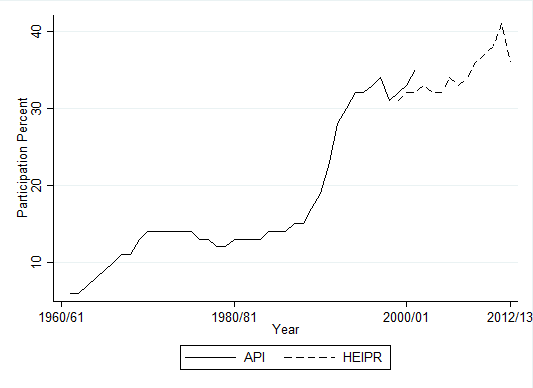 The API was discontinued in 2001 and replaced by the Higher Education Initial Participation Rate (HEIPR), which has a different definition as it covers entrants to HE from different age groups (for the one reported here covering ages 17 to 20). But we also know that the wage premium for graduates still holds strong. The latest economic research on the financial returns from university education show that earnings for degree holders compared to those with A-levels are between £105,000 and £250,000 over a lifetime (BIS, 2013). If supply has gone up, and yet the wage premium is still positive, basic economics tells us that there must be a strong and continuing increased employer demand for graduates. So by this definition at least, we certainly do not have too many graduates. Of course there will always be examples of graduates ending up in low paid jobs. Just as there will always be examples of non-graduates going on to earn millions without a degree. But the basic economic facts tell us that it is still very much worthwhile, at least financially speaking to attend university, meaning that there is not an oversupply of graduates. Like in 1963, let’s hope that sensible minds prevail and we continue to strive for a sector where all those who are qualified and wish to enter HE are able to do so. Indeed. Regarding the BIS research you quote, have you any thoughts on the model they use, as the predictions for wage premiums (wage premium for women higher than men) seem counter-intuitive to me, and reverse earlier estimates by BIS. BIS Research Paper No 112 states that the wage premium for degree holding men is £168,000 and for women is £252,000. Yet older estimates from BIS had the premiums lower and men a higher premium than women (BIS Research Paper No 45 by London Economics gives £121,000 for men and £82,000 for women). On my reading of Research Paper 112, the model they use discounts a number of variables known to be correlated with wage premium including for example whether or not the individual has children and whether or not the individual is married. The Labour Force Survey data that forms the basis for the model I assume illustrates that a woman with children are far more likely to take a hit in their lifetime earnings than men. The earlier Research Paper (no 45) includes these variables (and a range of others) in its model. The authors of Paper 112 argue that that whether or not someone has children or is married are examples of ‘choices’ that happen after the degree is obtained, and therefore are not relevant. However, it rather begs the question: is not the £252,000 degree premium for women only then accurate for women who choose to stay unmarried and without children? Furthermore, how is that model any use at all for those of us that commence our university degree married, with kids, etc.? Do you have any thoughts / critique of the economic soundness of estimates currently used by BIS? As a co-author of BIS Report 112 allow me, as briefly as I can, to offer some clarification. 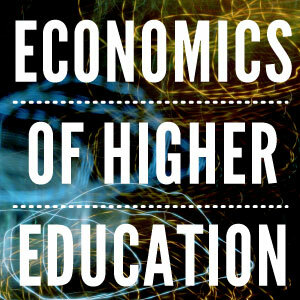 The report provides statistical estimates of the net financial benefits of higher education (HE) – relative to opting not to have HE. The analysis is based on a similar methodology as the earlier BIS Report but there are important differences – too numerous to explore here and I urge interested parties to read the report in depth. But here are some thoughts …..
First we deliberately chose to NOT control for some factors that we know are associated with earnings – like partnership status and children. Its true that women who have children earn less, in their lifetime, than women who do not (partly lower lifetime hours of work, partly lower wages per hour). This is true for graduate and non-graduate mums. But it turns out that, on average, graduates have fewer children than non-graduates and they have them later in life (perhaps because they earn more per hour of paid work). This means that we are likely to be underestimating the financial returns to HE relative to no HE. Its true that university comes after children for some people – but it turns out it’s a very small proportion so we concentrated on the important issues in the work. And, of course, if you already have them then that you have them whether you decide on HE or not – there is no second hand market in children! Marital status per se (which we also feel we should ignore) is less important – although it may even be the case that one of the “benefits” of HE is that it leads to a partner who will, on average, have higher earnings – something else that we ignored because we looked at individual rather than household income. In terms of household income, this suggests that we are again erring on the conservative side. Secondly, the report goes to great pains to emphasise that these are statistical estimates of average HE vs no HE differences. There is a LOT of variance around the average so it is misleading to talk of THE earnings premium – there is a wide distribution of premia. Where any individual will be within that distribution is impossible to say. Some of it is due to ability and effort (reflected in the larger average premium we find for a high class degree than a low one). Some of it is due to choice of subject studied (see the report for the highs and lows but bear in mind our caveats). We thought that some of it would be associated with type of HE institution attended but we actually found it quite difficult to show robust differences across types (and this is something we continue to work on now that we have better data). And some of it is simply unobservable. Thirdly, while the mean of the estimated distribution in the report was higher than other mean estimates in the literature, the report goes to great lengths to try to show why it is higher. One important factor turned out to rely on the fact that we allowed for the possibility that the average difference between graduate earnings and no-graduate earnings could change over time. There is a large literature suggesting that the supply of graduates is not keeping up with demand. The demand for graduates is rising largely because of technological change – the world of work is getting more complicated and this trend has helped the earnings of highly skilled labour at the expense of the lower skilled. The average graduate premium has been rising over time to reflect this “skill-biased” technological progress. The earlier BIS report (and much other work) did not allow for this possibility. Even our estimated ½ % annual average difference in productivity growth between graduates and non-graduates, which seems modest, makes a lot of difference over a 40-50 year working life. Of course, we do not know that this trend will continue. But it seems safer to assume that it will, rather than to assume that it will stop entirely. If, like earlier work, we assumed no productivity growth difference we would get similar (and still large) average premia. While our focus was on money, it is not the case that the analysis suggests that people SHOULD make choices based on a financial criterion. There are many non-financial benefits to HE – for example, graduates are (on average) healthier and happier even controlling for their average higher incomes. Again this points to us being conservative. Finally, the analysis does NOT point young people towards higher earning subjects. The loan scheme provides even bigger subsidies to financially less successful graduates. If you have a passion for Fine Art, which (on average) has lower financial returns, then you should be MORE inclined to follow your heart under the new loan scheme than without it. And if you want to attend HE for the parties, with the intention of just scaping by, then (sadly) you will find that you are relatively more highly subsidised under the loan scheme than without it.